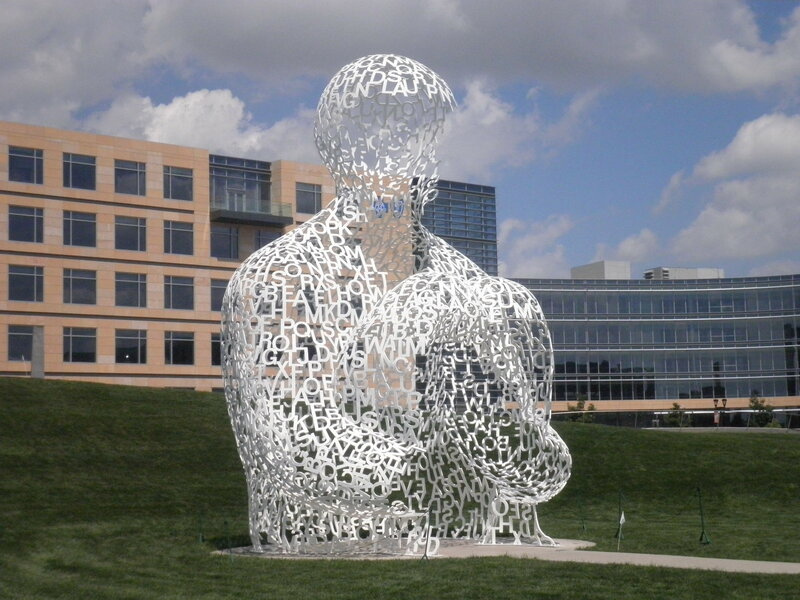 That’s Nomade by Spanish (Catalan) artist Jaume Plensa. It sits in Des Moines, Iowa’s Pappajohn Sculpture Park. Plensa says that the form of the figure relates to the knees to chest contemplative position his son assumes from time to time. Pretty cool. Though subtly, it is even more engaging than his wildly popular (and similarly scaled) Crown Fountain in Chicago’s Millennium Park. A visitor’s connection with the fountain is quite physical – it literally spits at you. The experience is more cerebral in downtown Des Moines. Though quite large it does not impose, but rather floats somewhere in between concept and materialization. The name ‘Nomade’ is French not for nomad, but for nomadic or wandering. An aspect of an open mind. One can travel far from a state of quiet repose lingering wherever thoughts might crystallize – whether that be into person, place, or thing. Far as we know, we’re alone with that ability and along with an ability comes responsibility. About another, very different work “La Larga Nit” Plensa recalled Catalan writer Vincent Andres Estrelles “who wrote that it is the responsibility of the poet to watch out for the whole community”. Plensa said about his Nomade: “It is made to embrace you as you walk into it, to transform the body as it creates a home for it.” It may have been the heat, but I felt electrified. Beam me up Scotty! *The Poppajohns gave $1.65 million for this sculpture at Art Basel Miami in 2007. **The park has work by many other artists including: Caro, Bourgeois, Butterfield, Kelly, Burton, Cragg, LeWitt, di Suvero, and Serra. **The Poppajohn Sculpture Park is just west of the center of downtown. If you’re going by on I-80 you could be All-American and see all of the installations without even getting out of your car. But you’d be a dope to do that. Get out, walk around, explore the nearby new public library designed by David Chipperfield, have lunch at Centro, then get back in your car, drive a bit west until you come upon the spectacular Des Moines Art Center. Check out its three wings: Saarinen, Pei, Meier. Then get back on your sled a new person and move on. This entry was posted on August 13, 2010 at 8:43 pm and is filed under Art. You can follow any responses to this entry through the RSS 2.0 feed. You can leave a response, or trackback from your own site.